I had a wonderful evening. 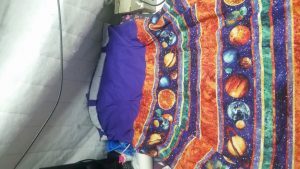 I was sitting in my sewing room working on this Solar System sundress, the picture of which, for some inexplicable reason, came in sideways. Add that to the list of things to fix. So, I am sitting here, happily sewing away, and the phone rings. It was a group of college students needing help completing an assignment for their astronomy class, which is due tomorrow. Now, as you may have guessed from the theme of the sundress, I like astronomy. A lot. These students found me on one of my other websites, http://www.stellarexperiences.com. Being the kind hearted soul I am, and a suckered for an opportunity to impart astronomy on someone, I dropped my sewing project, changed clothes, packed some astronomy gear, and headed off to Shelter Island. I spent a couple hours teaching a very nice lady and Marine Corps veteran the wonders of the night sky, highlighting Saturn, Mars, Sagittarius and Scorpius, and helping to ensure she had enough info for the paper she had to write on her trip to a planetarium, observatory, or night sky tour, and quizzing her on information for her final exam in two days. It was amongst the best evenings I have had in quite a while: it started off with one favorite hobby, and ended with the other. And most people think sewing and astronomy have nothing to do with one another. Ha!! Thanks for reading, and I hope to see you hear again soon.